Are you looking for the best things to do in Dingle, Ireland? You have definitely come to the right place! 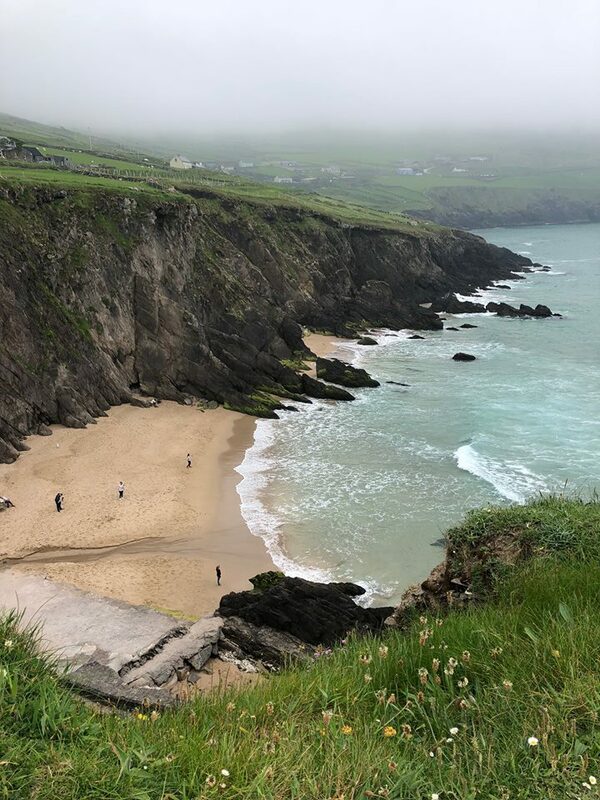 Located in County Kerry, in the southwest of Ireland, on the epic Irish coast, Dingle is about an hour drive from Killarney and well-worth the drive to get there, on the scenic Wild Atlantic Way. Dingle boasts the absolute most gorgeous seascapes that will take your breath away. It is not quite as touristy, as the larger Irish cities, so you get more of the local Irish flair, and has an abundance of things to do. 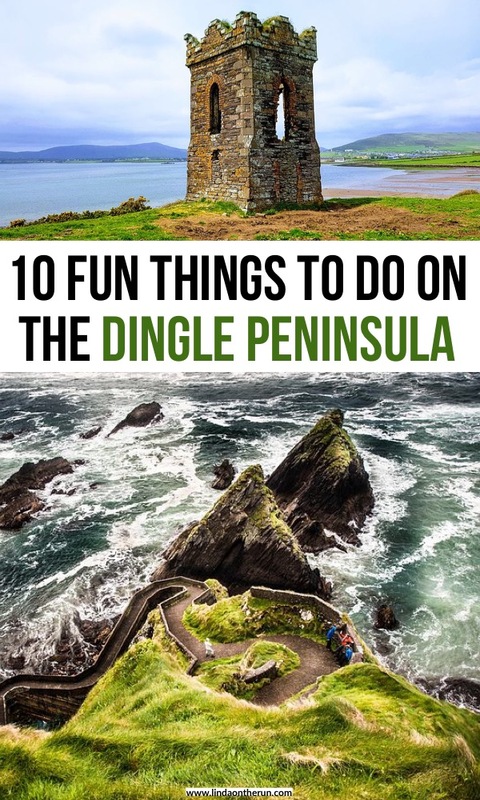 Some of the options are in the town of Dingle Ireland and others are on her outskirts but ALL are worth your time and you will be richly rewarded by all the great things to do in Dingle you can choose from! There are so many things to do in Dingle Ireland. Here I am in downtown Dingle. 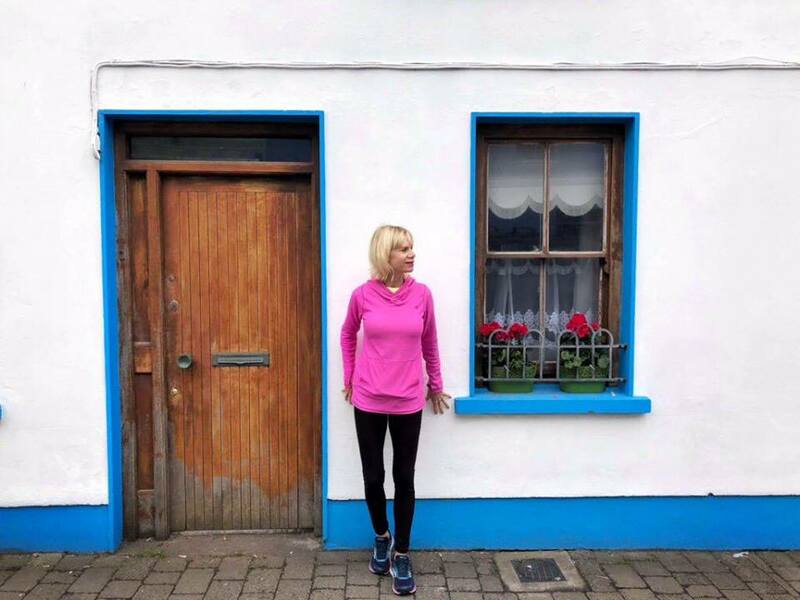 The entire town is just as charming as this Irish cottage is! Number One: Look For Fungi The Dingle Dolphin! Who doesn’t love dolphins? They are so cute and lovable! 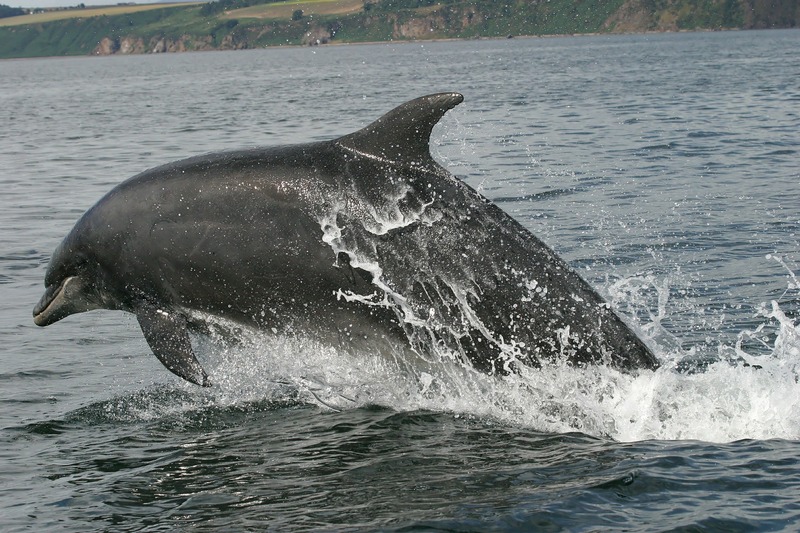 Dingle has its very own resident dolphin, named Fungi! And he is very friendly, most of the time. What better way to experience one of the popular and fun things to do in Dingle than by booking a one-hour boat tour to go find Fungi and other sea life in and around the Dingle peninsula! Fungi has been hanging around the Dingle Harbor since 1984 and when in a good mood, he “puts on a show” for the boats he comes in contact with, and especially loves attention from humans! If you are brave enough, you can even swim in the chilly waters with him in the Dingle Harbor if you are brave enough. He is known for escorting Dingle’s fishing fleets into and out of port. Maybe your boat tour will be the one that gets a special Fungi show! On a good weather day watching Fungie and his antics is one of the best things to do in Dingle! 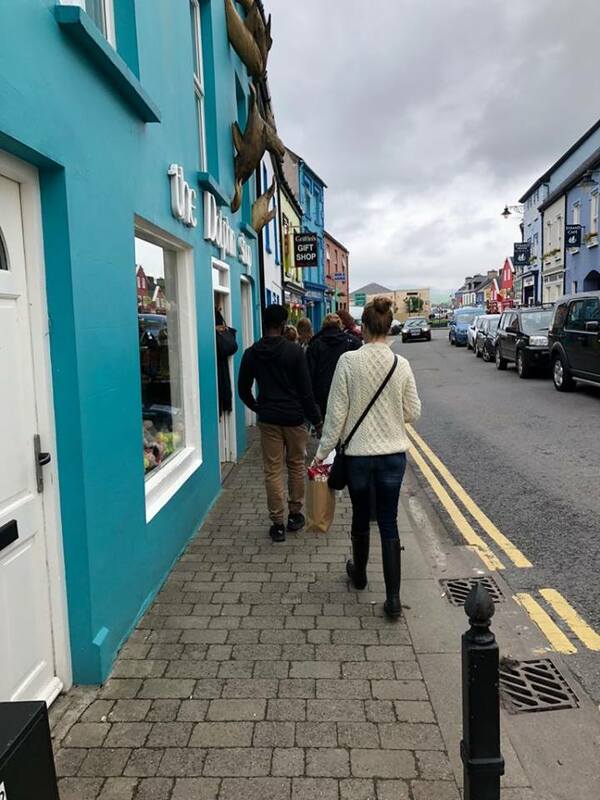 One of the neat things to do in Dingle is to take a stroll and browse the many shops and businesses. There is a decidedly local flair in Dingle, which is most often reflected in the things being sold. From bookshops to carvings, to arts and crafts, there will be something you will likely find irresistible! I always like to purchase locally handcrafted souvenirs, and I was warned in Dingle that some establishments remove the “made in ‘wherever'” labels or tags and replace them with something stating the item was handcrafted in Ireland. Buyer beware! If you are out for an Irish handmade item, whatever it is, attempt best as you can, to verify with the shop owner its authenticity. Shopping and sightseeing in Dingle Ireland with the Follow Me Away duo, Victoria and Terrence. 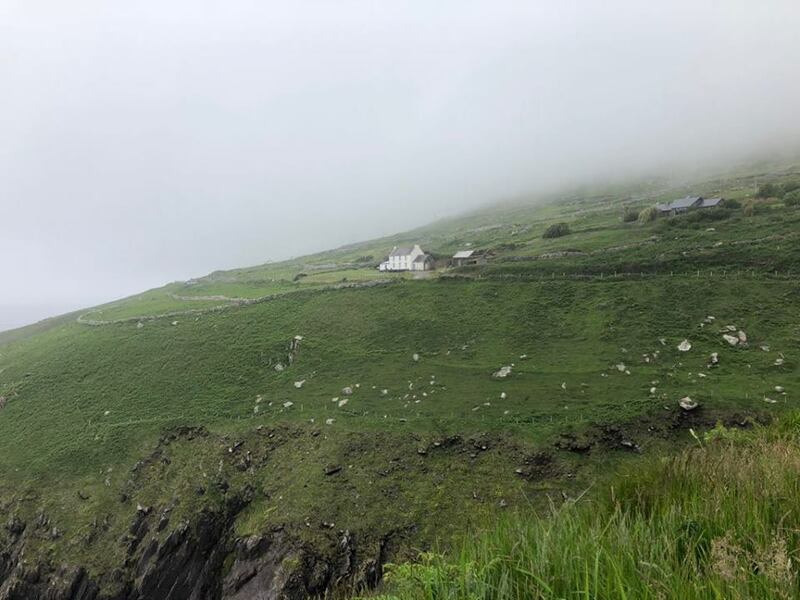 If you are on a road trip or staying at an Air B&B, you may not be interested, or able to afford, to eat out three meals every day, for your entire stay in Dingle Ireland. So food shopping may be one of the first things to do in Dingle on your list. Rest assured, grocery stores and convenience stores and pharmacies abound in Dingle Ireland. I am vegan, and I often appreciate a home cooked meal when I travel, and I found the selections of local produce and fresh baked goods outstanding. I even snared affordable organic peanut butter in a Dingle supermarket. I find peanut butter cost-prohibitive in Europe; everyone eats Nutella instead. 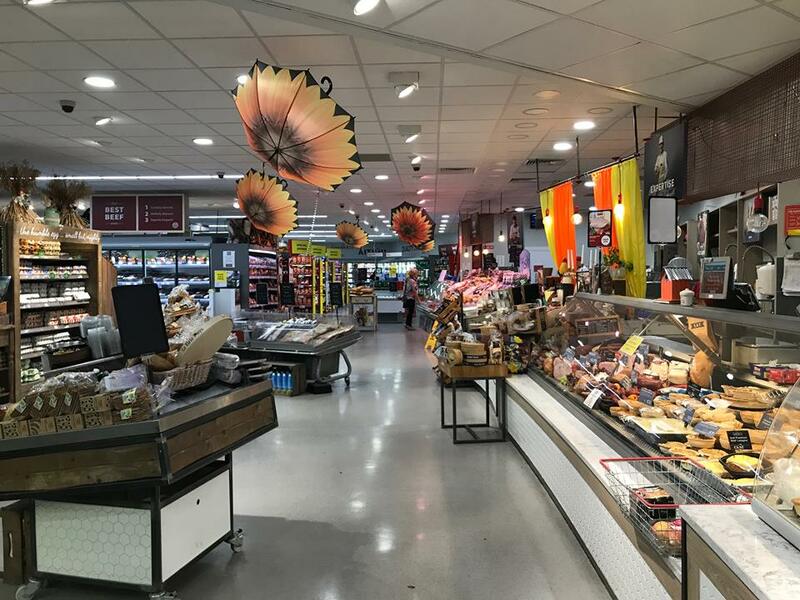 I was very very impressed with the grocery selections, including various types of coffee beans and salad oils while shopping for food and necessities in Dingle. Again, this is great news for those of us who enjoy or prefer cooking our own meals or simply eating in to avoid hustle and bustle and cost that comes with eating out a lot. If that is also you, place shopping at the supermarket at the top of your list of things to do in Dingle. Check out how clean and bright this Dingle grocery store is! And wow, what a great selection of everything! 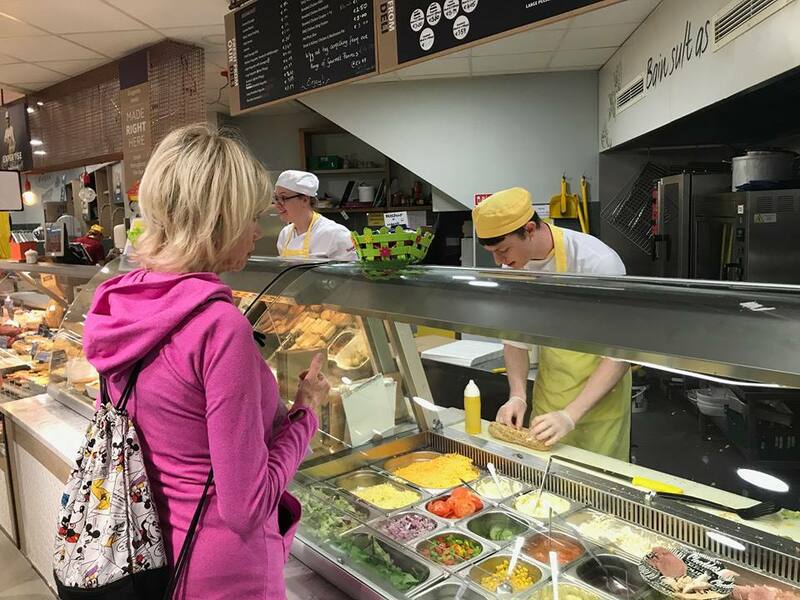 Here I am in a Dingle supermarket grabbing a quick vegan sandwich for lunch, made especially for me. Number Four: Check Out Live Irish Music In Dingle! 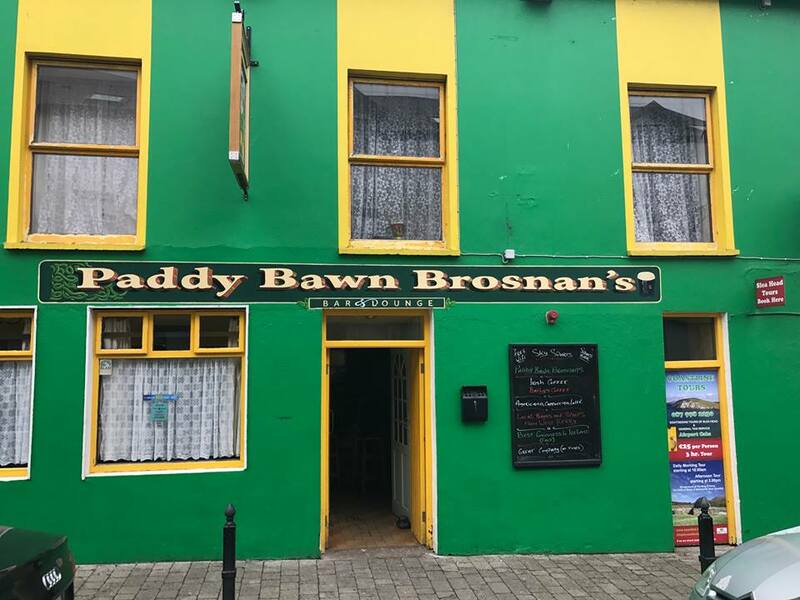 Of course for the true Irish experience, one of the best things to do in Dingle is to lift a glass, laugh a little, and enjoy yourself in one of the local Irish pubs. There is a myriad of local bars and pubs that offer pub food, lots of types of beer for you to choose from and local Irish music. If you find yourself like me not interested in consuming alcohol or not particularly liking beer, the ambiance and frivolity that accompanies lively Irish music cannot be beaten. 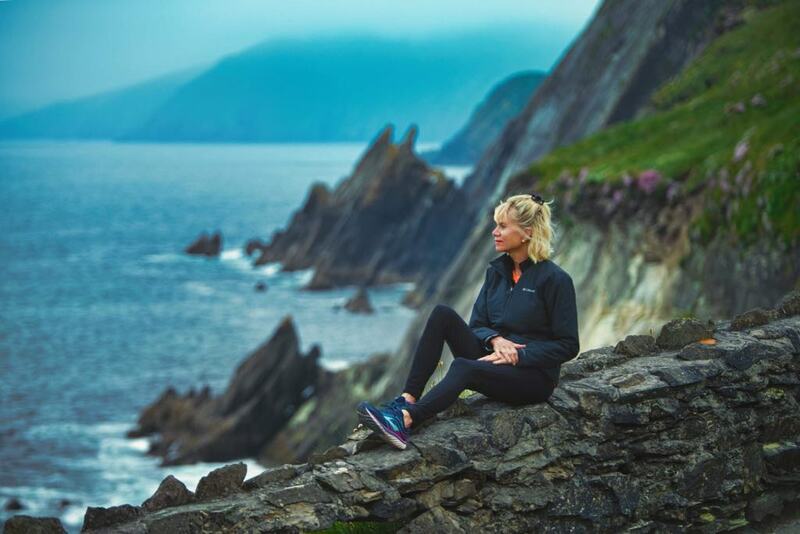 The next six things to do in Dingle are destinations outside of the city and take advantage of some of the most beautiful and unforgettable places and vistas on earth. At approximately twenty-six miles, Slea Head Loop rivals the Ring of Kerry any day and every day! It is a circular route that begins and ends in Dingle and is part of the Wild Atlantic Way. 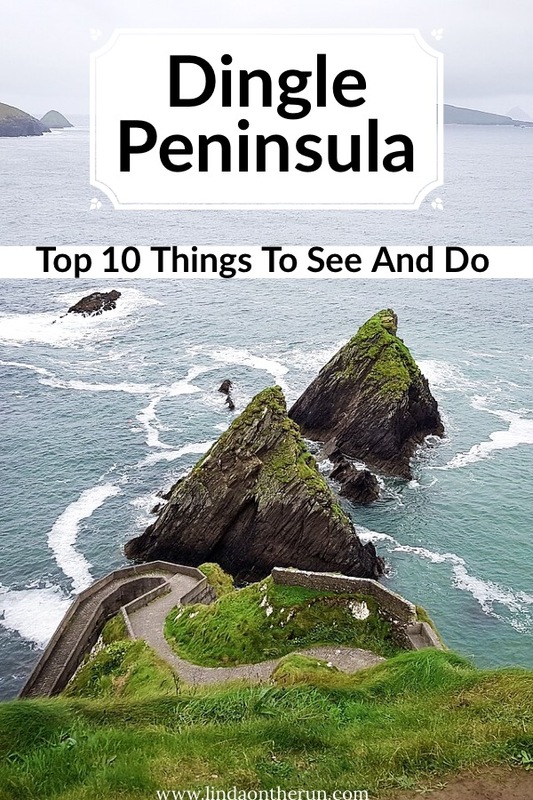 It can definitely be completed in one day, but make sure you stop A LOT at the pullovers to oooh and ahhh at the gorgeous Irish seascapes. Do be careful when driving Slea Head Loop because it is twisty and twiney and very narrow at times. 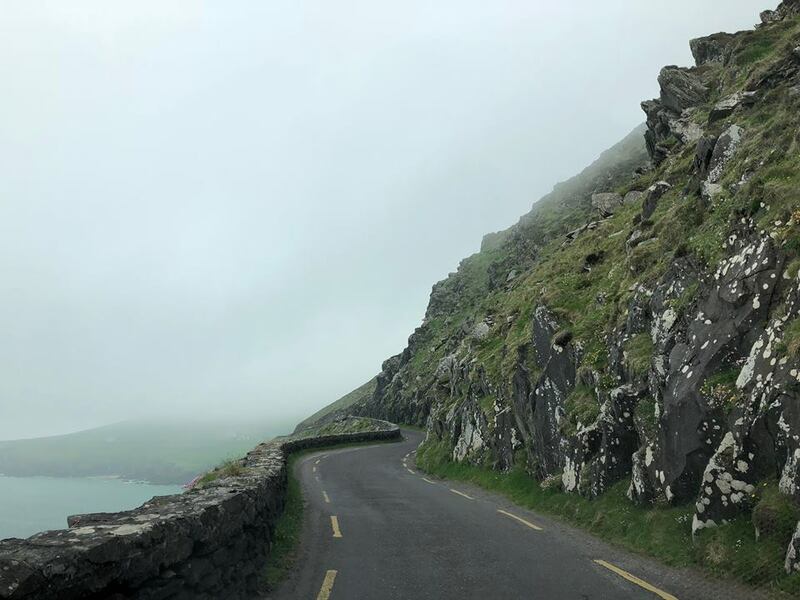 The misty and mysterious weather of the Dingle peninsula makes this drive unforgettable and a definite must do and must see! Slea Head Loop is one of the things to do in Dingle that distance cyclists take advantage of. So be careful and share the road with them. And if you are the cyclist, remember to take extra caution as cars drive clockwise (to attempt to avoid the large tour buses) on the left side of the road! Driver beware! Here is an example of the one lane road that is the Slea Head Loop! Slea Head Loop Crucifixion roadside statue. Number Six: Slea Head Loop Beach And Star Wars Rock Formations are very popular things to do in Dingle. You actually do not have to be a rabid Star Wars fan to appreciate and enjoy the unbelievable rock formations used in the 2015 Star Wars blockbuster space film, The Force Awakens. 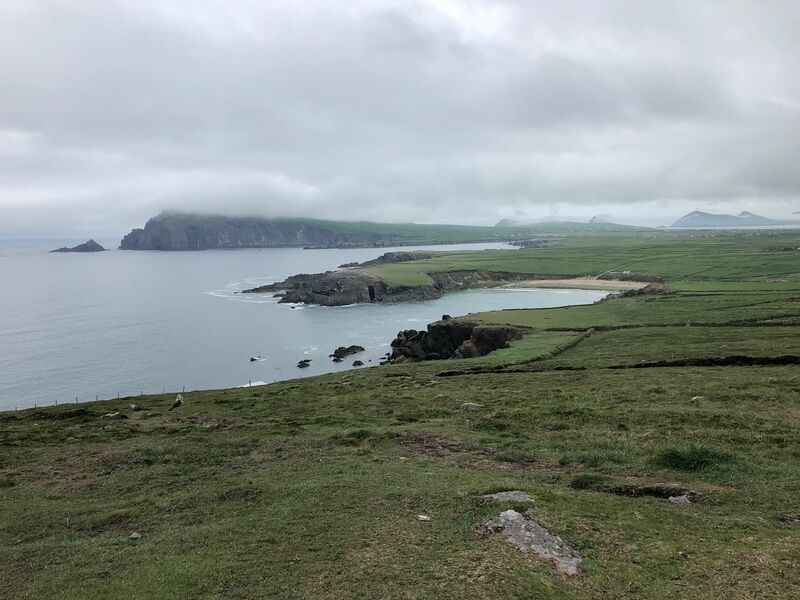 There is a very crowded lot to pull into you will notice while driving along the Slea Head Loop that will bring you to the otherworldly rocky formations that were used in the Star Wars film. Such a beautiful and stunning vista. To get nearer to take better photos of the formations it is a fairly steep descent, so make sure you have closed toe sneakers or hiking shoes to assist with navigating that descent and then when you are finished, the ascent back to the parking lot. Also located at this spot at sea level is the sandy Slea Head beach. It is a steep walk down to the beach and worth it if you are up to it and have the time. When I visited, the water of the Atlantic Ocean was chilling cold (and the air temperature was not much warmer!) yet there were quite a few people with wet suits swimming in the water. Take your time walking back up the steep hill back to your vehicle in the parking lot. This stop is one of the interesting and unforgettable things to do in Dingle. Do not miss it. Star Wars rocks, used in the 2015 megamovie The Force Awakens. Slea Head Loop beach, beautiful and sandy! 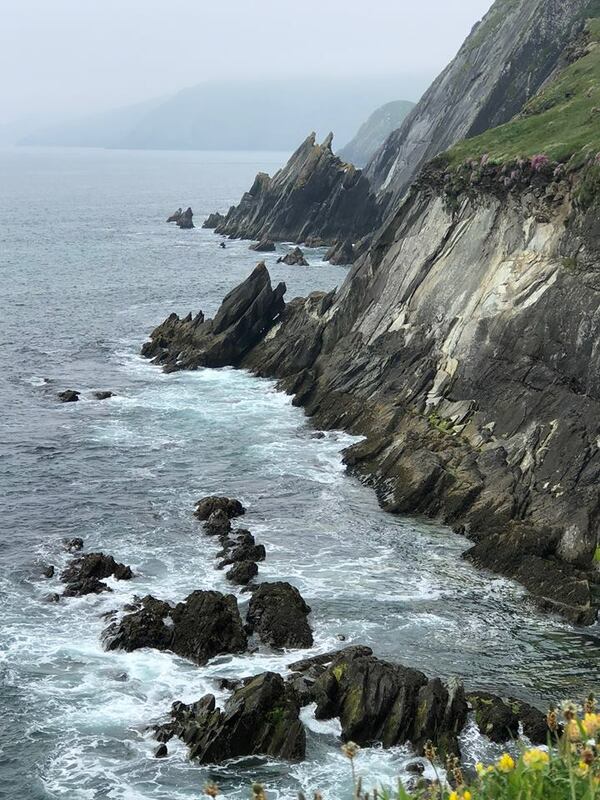 Number Seven: Stopping At The Famous Dunquin Pier On The Slea Head Loop is one of the coolest things to do in Dingle! You might miss this stop and miss out one of the most iconic things to do in Dingle, so be on the lookout for it. 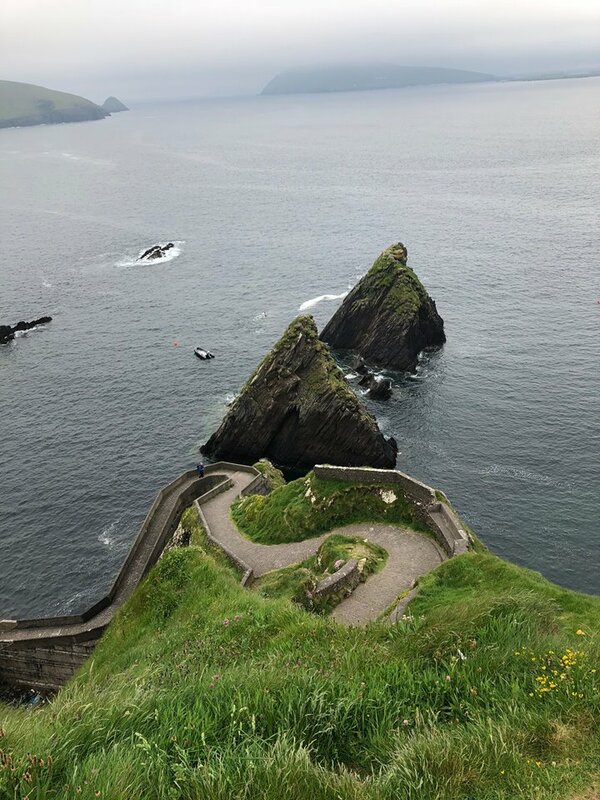 You will recognize the walkway down to the level of the sea as one of the most iconic locales in Ireland and often used in Irish publicity campaigns. The pier and the boats that stopped there were at one time the lifeline bringing livestock (sheep!) food and medicine and all necessary supplies to the Basket Islands when they were inhabited. The views from the road are stunning and you will be able to walk halfway down and even all the way down to the pier which is at sea level, but it is VERY STEEP and you need to be cautious and take your time. You will WANT to take your time because there is much to see along the way. The views of the rock formations change with every step and the wild Irish flowers we saw along our walk were very beautiful. There is a cement bench made into the wall of the walkway that you can use to rest. Use it especially if you decide that a trip all the way to the bottom is your ultimate goal. Those in your party who do not or cannot continue further can use the bench to take a break until you return. Once you reach the bottom to the pier, you can contemplate just how much work it took to get the animals, food, and necessities from the road all the way down, and probably back up upon their return, to and from the Blasket Islands! This is the iconic shot of the Dunquin Pier that is often used in Irish publicity campaigns. Here I am sitting on the bench drinking in the beautiful Irish seascape. The Blasket Islands are in the background. And look at the gorgeous wild Irish flowers. You will want to add this stop to your list of things to do in Dingle Ireland. 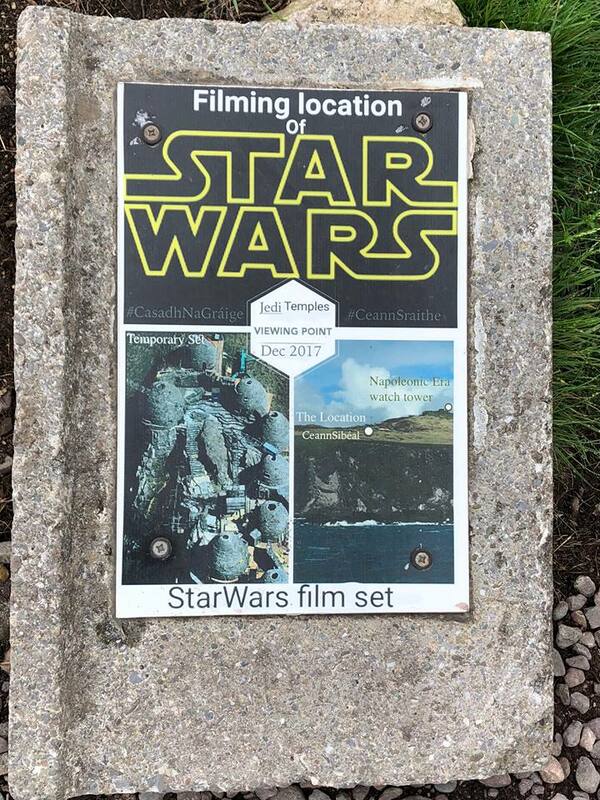 Again, even though you may not be a huge Star Wars fan, visiting the 2017 Star Wars filming location of the epic space movie The Last Jedi is another one of the fun things to do in Dingle. There are two information panels at the viewing point explaining the film set and pointing out specific spots along the countryside used in the Star Wars movie. It is an easy walk down to the panels but it is a gradual descent, so remain vigilant and be careful when walking! The area is a wide expanse of green and there are plenty of opportunities to get some great picture taking done. And look out for sheep grazing nearby. They make for a really authentic Irish picture which should be one of the things to do in Dingle anyway! Can’t you just imagine the Jedi Temples from The Last Jedi? 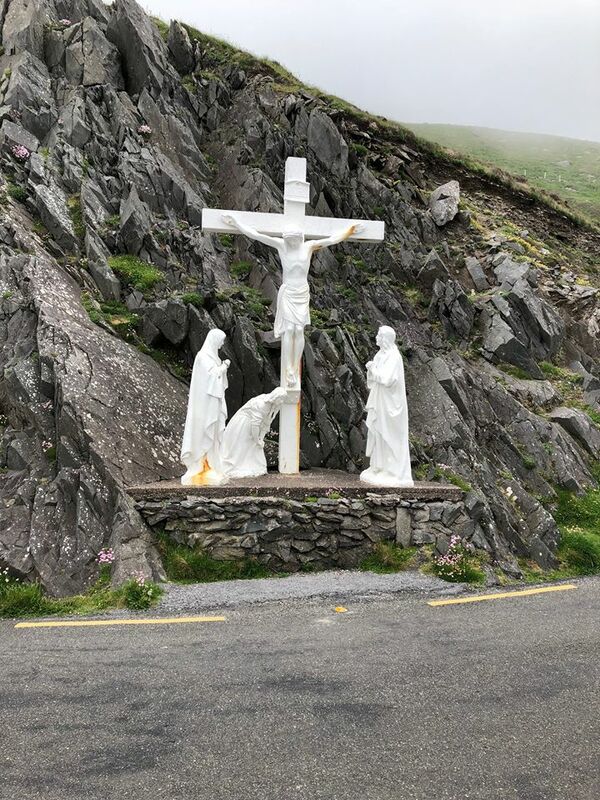 One of the amazing things to do in Dingle is drive through Connor Pass, the highest mountain pass in Ireland at 1,496 feet at its summit. The epic and panoramic vistas seem to go on forever. And you just might want to stay almost for forever to drink in all the beauty! Tour buses cannot make it through Connor Pass because the small one-lane road is simply too narrow and twisty. So, you may need to rent a car in Dingle (if you have not already, or you are driving your own car.) Please note, trucks nor camper vans will make it either as they are also too large. From the parking lot at the summit, it is said on a clear day, you are able to see all the way to the Aran Islands. Hope you have clear weather when you visit Connor Pass! As a caution, this drive while one of the most beautiful in all of Ireland, is one of the most dangerous due to rapidly changing weather conditions. Make certain you are aware and informed of the local weather forecast the day you plan to drive to Connor Pass. Here I am lost in thought admiring the Irish seascape. The Star Wars rocks are behind me. The Irish are strong in their belief in fairies. And learning the history, superstitions and traditions associated with the Irish “fairy forts” will enhance your Dingle experience. They are even considered sacred places in some circles. The “fairy forts” or ring forts are remains of early inhabitants’ circular dwellings and today look like circular grass mounds. Tradition has it that they hold magical properties and are the entrances to the fairy world. There are lots of legends that tell of the fairies’ revenge if the mounds are disrespected or damaged. It is said that while the locals are very skeptical, they take great strides to show respect. No one wants to be cursed by an offended fairy! 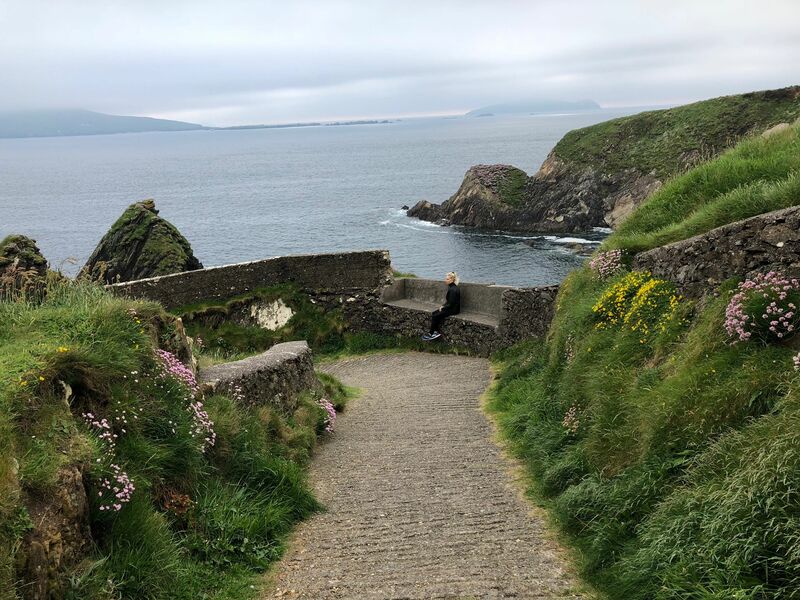 So you now understand why learning about and seeing these mystical fairy forts is certainly one of the most interesting things to do in Dingle. Large clouds descending during upon the Irish landscape along the Slea Head Loop during a late afternoon drive. Scenes like this are repeated all along the way and driving Slea Head Loop should definitely be one of your top things to do in Dingle. Dingle and the Dingle Peninsula, located on the Wild Atlantic Way, is simply one of my favorite places in all of Ireland. The rugged landscapes, the history and traditions, and superstitions all add up to make Dingle one exciting location with lots and lots of things to do in Dingle for you to choose from! Have you ever been to Dingle? Did you fall in love with it like I did? Where else would you recommend a first-time visitor visit? Please post your ideas in the comment section below. The Dunquin Pier looks so lovely! And I’m so curious about the fairy forts. I always love seeing very old places people called home when I travel! We loved this piece and must say, that dolphin shot is exceptional! Thank you for sharing! I loved Dingle and thank you for the compliment. Love the beautiful craggy coast! You are awesome by the way. Would love to see those Star Wars film locations. I was there briefly and didn’t know about the dolphin! Hey Cherene! Thank you for the cool compliment! The 2 Star Wars locales were awesome. Hope you get to see them one day. Slea Head loop sounds great. Ireland’s on the list but not for a little while. You made me want to go now. I Loved Slea Head Loop much better than the Ring of Kerry! There’s lots to do and lots to see in Ireland. Hope you get there sooner than later. Those views are beautiful, and I would love to see Fungi in person!! And the Irish history is very interesting too! Hope you get there and see Fungi soon. It sounds fabulous and your pictures are beautiful. I’ve been to Ireland once and had an epic time. When I return I will have to take your suggestions with and find all these great places. Thanks Christine. Hope you do get back there someday. It really is epic. Would say it’s safe for a woman to travel throughout this area alone? I’d like to rent a cottage for about a month…….March into April. I think so. I was not uncomfortable at all. We drove connors pass about 15 years ago, at that time tour busses were driving it as well. There really isn’t room for both to meet, we ended up off the road. Lucky for us we were going up and wasn’t on the side looking down. Yikes. Those roads are so very scared aren’t they?? ?